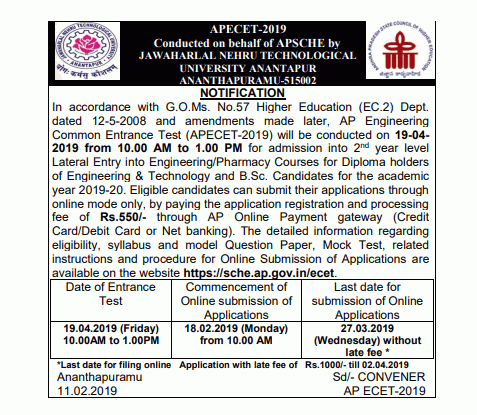 AP ECET Notification 2019 : Andhra Pradesh ECET 2018 Notification Released by the JNTUA on behalf of the Andhra Pradesh State Council for Higher Education (APSCHE). Andhra Pradesh Engineering Joint Entrance Test (AP ECET) was conducted by Jawaharlal Nehru Technological University, Ananthapur on behalf of APSCHE. Registration requirements, application fee, application procedure, examination pattern, examination preparation and important dates can be found below. This initial test is offered to graduate holders of engineering / pharmacy & B.Sc graduates (with mathematics) for admission by entering the 2nd year level in BE / B.Tech / B.Pharmacy Programs Universities in AP For the Academic year 2019. Candidates should complete the degree in engineering sciences and engineering / pharmacy / B.Sc, depending on the case with at least 45% mark (40% in the case of candidates who belong to the reserved category). The registration fee for AP ECET - 2019 is Rs 500 / -. The candidates can be paid in AP Online Centers or via the Payment Gate way (credit card / debit card / internet banking). Appropriate candidates go to the official website Check the notification. Click on the online application form, read the instructions and complete the application form with the required fields. 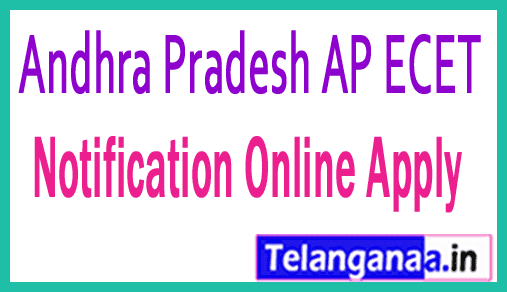 AP ECET 2018 Application form Available on the official website of 24 February 2018 .